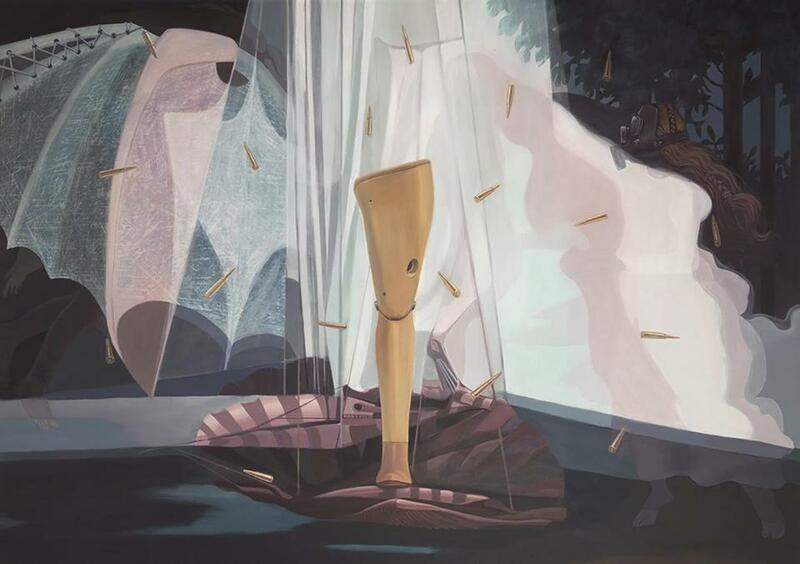 Many of Minoo Emami’s paintings and 3-D works in “The Aura of War,” at the University of Massachusetts Boston’s Harbor Gallery, revolve around prosthetic limbs. Not the high-tech legs that help amputees refine their movements like athletes, but old-style, plastic-looking legs and feet without much twist or give. They’re loaded. You resist looking at them, yet you can’t look away. Emami, an Iranian, grew up during the Iran-Iraq War in the 1980s. She married a wounded veteran who had lost a limb. Land mines buried during that conflict are still a threat. For an artist, artificial limbs balance notions of trauma and loss with possibilities of rebuilding and redemption. They’re simulacra, poor substitutes for the real thing, yet they help an amputee get on with life. Emami freights her works with those contradictions. In the painting “Us,” she depicts a woman’s arm wrapped around a prosthetic leg that cannot feel a tender caress. She collaborated with Iranian women touched by war to adorn used prosthetic legs, often with traditional Persian craft techniques. These make striking sculptures, half-violent, half-sacred. The limb, a metaphor for wounding, doesn’t lose its ragged punch, yet it has been lovingly reclaimed. “Goli” is clad to the ankle in handmade blue tiles, brass, and mirrors; “Sara” wears traditional Kurdish dress materials, and is topped with an embroidered symbol of fertility. Emami largely focuses on war’s impact on women and children, and her work can get political. “Hostage” evocatively extends the idea of losing parts of oneself to the female voice, silenced by oppression in Iran. She covers a handmade traditional stringed instrument in shards of mirror, sealing it up so it cannot be played. The show feels piecemeal: a bit of this, a touch of that. Her paintings occasionally forsake urgency for a preachy tone and tired metaphors; for instance, images of scars don’t have the same power as the prosthetics. We all know war is brutal; more than anything else here, the art made with artificial limbs communicates that viscerally. Nearly a fifth of the world’s population lives with water scarcity, and climate change is exacerbating the problem. Two artists at Boston Sculptors Gallery tackle the issue with humor, Jessica Straus sardonically, and Michelle Lougee sweetly. Straus builds creaky metal containers and wraps them in bright signage denoting non-potable water. You can’t read the signs; she chops and layers them into abstraction, but the message of the conical “Oiler,” and of “Non Potable,” which looks like a gas can, cannot be missed. How do fossil fuels impact water supplies? And then: Drink, anyone? In a second body of work, Straus morphs globes into blimps and balloons. “Churn #2” looks like a water balloon drooping and swollen below a hand crank, and “Blimp #1” turns the earth into a bloated dirigible, and we all know what happened to the Hindenburg. Lougee crochets plastic bags into biomorphic sculptures, letting her commonplace, unrecyclable material do the talking. The installation “Ubiquitous,” a constellation of wall sculptures representing micro-organisms in a single water droplet, looks like it could decorate a child’s bedroom: bold colors, goofy forms, knobby textures. Resin makes them shiny. The bright blue “Mover” has orange tentacles tipped in red. “Large Red and Orange” is red with rings of turquoise surrounding jutting orange sphincters. Sphincters aside, these funky, endearing works — in “Ubiquitous” and elsewhere — feel approachable; each piece might be a character in an animated cartoon. We almost forget they’re all crafted with throwaway plastics — handy for us; poison to the environment. But the material is ever-present and insidious. Both shows insist: Wake up. Preserve the water. Steward the planet. New galleries continue to pop up like spring dandelions in the SoWa district. Matter & Light Fine Art’s first show spotlights Cambridge painter Joshua Meyer, who exhibits in Provincetown and San Francisco, but is a newcomer to the Boston gallery scene. His portraits, largely made with a palette knife, coalesce out of jittery patchworks of color, as if the space around each sitter — indeed, the space between the sitter and the artist — bristles with a push-pull energy. We’re drawn toward the figure, we want to learn more, yet we must — initially, at first — fight to get there. Then, as in “Ligaments,” there’s a tipping point; we’ve made it through the shimmers and shards, and we’re suddenly drawn to the center, where a girl sits, legs stretched in front of her, head bowed. Perhaps she’s reading, or focused on an electronic device. Here, Meyer’s paint handling grows delicate, although you still see the facture. It’s quietest in the center of the canvas, where the girl’s plum shirt is a place to rest. But her face, her eyes are constructions of built-up paint. As with all Meyer’s paintings, you have to step back to see the picture; close-up, you’re in the thick of its making. These works ask: Can we truly see anyone close-up? They aren’t so much portraits as they are depictions of intimacy: We think we know our loved ones, but do we?